One of my favorite Jazz writers, John Kelman, has written a great review of the new Jeff Beck DVD Performing This Week... Live at Ronnie Scott's for All About Jazz. Mike Godin and Steven Casado! Mike and Steven have each won a copy of Jeff Beck's new Live at Ronnie Scott's DVD. Congratulations guys! Thanks to everyone who entered the giveaway! Win a copy of Jeff Beck's new "Live at Ronnie Scott's" DVD! The Guitar Channel is giving away two copies of the new Jeff Beck DVD Performing This Week…Live at Ronnie Scott’s. (Two?!? That's right... 2.) From the official press release - "Filmed over the course of several gigs at the famed Ronnie Scott’s Jazz Club in 2007, Performing This Week…(CD released November 25) features a compilation of material spanning Beck’s genre-jumping career. From Rock to Jazz to Blues, with some Boogie and Beatles to boot, this was a week that positively rocked the intimate London club. His band includes Tal Wilkenfeld (bass), Vinnie Colaiuta (drums), and Jason Rebello (keyboards). Joss Stone, Imogen Heap, and Eric Clapton also made special appearances, complementing Beck’s wild guitar work with their diverse vocal approaches." The DVD (which will be released March 31st) also includes interviews with Beck and his band. The DVDs I have for this giveaway are standard all-region NTSC discs (they are not Blu-Rays). You want one? Simply send an email to guitarchannelcontest@gmail.com with the subject Jeff Beck DVD Giveaway. On Monday April 6th, I will choose 2 entries at random and announce the winners on the site. One entry per person please; past Guitar Channel contest winners are not eligible (gotta spread the love man!) Many thanks to Universal Music Group for making this giveaway possible. Good Luck! On March 31, Eagle Rock Entertainment, through it’s Eagle Vision subsidiary, will release Jeff Beck Performing This Week…Live at Ronnie Scott’s on DVD and Blu-Ray. Filmed over the course of several gigs at the famed Ronnie Scott’s Jazz Club in 2007, Performing This Week…(CD released November 25) features a compilation of material spanning Beck’s genre-jumping career. From Rock to Jazz to Blues, with some Boogie and Beatles to boot, this was a week that positively rocked the intimate London club. His band includes Tal Wilkenfeld (bass), Vinnie Colaiuta (drums), and Jason Rebello (keyboards). Joss Stone, Imogen Heap, and Eric Clapton also made special appearances, complementing Beck’s wild guitar work with their diverse vocal approaches. These DVDs are the first to be approved by the man himself. They are stocked with not just a conglomerate of great performance picks, but stellar bonus material. A rare in-depth interview features Beck talking about his experience at Ronnie Scott’s, as well as giving the floor to his band members for some interview time. The Blu-Ray also includes an exclusive 7-track rockabilly set with the Big Town Playboys. Eagle Rock Entertainment develops, acquires and produces music programming for a wide range of notable and high profile artists, which the company distributes on a worldwide basis. Eagle Rock Entertainment, Eagle Vision and Eagle Eye Media are wholly owned divisions of Eagle Rock Group, LTD.
For more information regarding this and other Eagle Rock Entertainment releases, contact Carol Kaye at Carol@Kayosproductions.com. 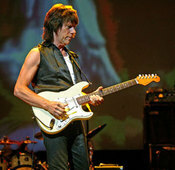 Jeff Beck is just finishing up a string of live dates in Australia. Here are the rest of Beck's 2009 tour dates that have been announced thus far. Beck is touring in support of his recently-released live album Performing This Week... Live at Ronnie Scott's. Iconic guitarist Jeff Beck played a string of 6 shows at the famous Ronnie Scott's Jazz Club in London in late November of 2007. Beck's band for these gigs included the always-amazing Vinnie Colaiuta on drums, Jason Rebello on keys, and on bass - one of most impressive young players to hit the jazz fusion scene in years; Tal Winkenfeld. The shows were recorded, and the resulting release, Performing This Week... Live at Ronnie Scott's (Eagle Records), features what Beck considers to be the best versions of the various songs. It's a fantastic collection of tracks that just happens to be one of the best fusion releases of 2008. One of the many strengths of this album is the band itself. This is the same group that caused quite a stir at the 2007 Crossroads Guitar Festival. I was lucky enough to be in attendance that day, and like many others, was eager to hear more from Beck's great band. Now we finally have the chance. The set list on Live at Ronnie Scott's spans Beck's entire career. After opening with his signature tune "Beck's Bolero," the band dives head-long into jazz fusion territory with Mahavishnu's "Eternity's Breath," followed by the Billy Cobham classic "Stratus." Right from the outset, it's clear that Beck's unique style is a key driving force for the entire band. Beck rarely plays a melody the same way twice. Instead, he fearlessly throws himself into the songs, seemingly with a "Let's see what happens when I do this" mentality. This approach lends itself to some great group improvisation. If you're going to hang in there as a member of Beck's band, you clearly have to be a great listener. One of the album's high points is the Blow By Blow classic "Cause We've Ended As Lovers," thanks in large part to a stellar Tal Wilkenfeld bass solo. The 22-year-old Wilkenfeld made a big splash with her 2007 solo album Transformation, which featured no less a guitarist than Wayne Krantz (who rarely does sideman work anymore). I have no doubt we'll be hearing lots of great work from Wilkenfeld for years to come. Vinnie Colaiuta fans need to pick up this album as well. There are tons of great Colaiuta moments here, such as the minute-plus solo he peels off at the end of "Blast From The East," before leading into one of Beck's fusion standards - "Led Boots." Jason Rebello is also rock-solid throughout; check out his high-energy piano solo on "Space Boogie." Killer stuff. The reggae influenced "Behind the Veil" has never been one of my favorite Beck tunes, until I heard this version. The entire band is in top form on this song, and Beck turns in his most energetic solo on the album. The band's dynamic take on the Beatles opus "A Day In The Life" is another example where everyone shines. Live at Ronnie Scott's is loaded with great examples of Beck's trademark touch and expressiveness. Beck hasn't used a pick in years, preferring instead the more personal touch of his bare fingers. Actually, I read somewhere that he gave up on picks because he kept dropping them onstage anyway. Regardless of his motivation, the dynamics he can pull out of a guitar using only his bare hands is stunning. The best example is probably the album's closer "Where Were You." The original Jeff Beck's Guitar Shop version of the beautiful ballad has for years had guitarists the world over asking, "How does he do that?" This live version will invoke a similar response, I'm sure. Beck was at the forefront of the early jazz fusion movement in the 1970s. Live at Ronnie Scott's demonstrates not only the continuing relevance of the genre, but also Beck's continuing importance to it. Any new release from Beck is a welcome treat - but sixteen live tracks with a killer band? That's a must-have album. I've received word that the release date for Jeff Beck's new live album Performing This Week... Live at Ronnie Scott's has been pushed back to November 25th. To hold you over in the meantime, check out this streaming version of the album's first single “Cause We’ve Ended as Lovers." Bassist Tal Wilkenfeld sounds awesome on this track... I can't wait to hear the whole album. From Nov 27th through Dec 1st last year, Jeff Beck played 6 shows in 5 days at the world-famous Ronnie Scott's club in London. Beck's band for these shows featured Vinnie Colaiuta on drums, Tal Wilkenfeld on bass, and Jason Rebello on keys. Each show was recorded, and a CD featuring what Beck considers to be the best versions of each track will be released on November 11th. You can pre-order the disc now through Abstract Logix. Check out the tracklist below. Jeff Beck will play 6 shows in 5 days at the famous Ronnie Scott's Jazz Club in London from Nov 27th through Dec 1st. Joining Beck for this rare run of shows will be Vinnie Colaiuta on drums, Tal Wilkenfeld on bass, and Jason Rebello on keys. This is the same band that played with Beck at the Crossroads Guitar Festival this past July. There's a ton of video's on YouTube now from the 2007 Crossroads Guitar Festival. This is one of the best. It's a proshot version of Jeff Beck playing the classic Beatles tune "A Day In The Life". Check out Tal Wilkenfeld on bass; she was awesome! I believe this video came from the MSN simulcast.